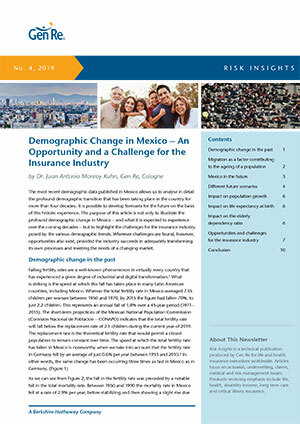 Developing new and innovative protection products is a focus for many life insurance companies as they bid to stimulate growth. Novel features are commonly added by simply extending coverage under an existing product. While this is an approach that is generally successful, some care is needed to ensure that the extended product will continue to work in the future, in line with original expectations. Our purpose here is to raise awareness that some risks, which have been overlooked or ignored during product development, may result in unexpected claims in the future. This article explores the potential for unintended consequences to emerge from product extension with reference to experience with a specific product in the Taiwan market. The work led us to recommend changes to this particular product to mitigate this risk. From a market perspective, Taiwan’s low interest rate environment has triggered a significant increase in insurance premiums, which in turn became an obstacle to sales. A Functional Disability insurance product has successfully emerged in this setting. The product is designed to target the needs of both the elderly and the working populations, and at comparatively low premiums. Sales have seen this product top the accident and health market for three years in a row. This product is based on a standard Personal Accident Disability Table, a model schedule of disability severity defined by the insurance supervisory authority for the purpose of personal accident covers. The innovation extends the benefit payment to disablement “caused by accident or sicknesses”, and the working age coverage period extends to whole of life. The comparatively low premiums are also guaranteed, with premium payment typically for 10 or 20 years. High persistency is anticipated after the end of the premium payment period, which means the portfolio itself is expected to “age” as policyholders get older. New customers have been attracted by the affordable premiums and the feature that now extends the policies to such conditions as dementia, future care needs, and conditions typically experienced after a dread disease diagnosis or severe disability. Some companies have opted to position this product as a low-cost alternative to standard LTCI. The simpler benefit trigger is seen as a particular advantage – compared, for example, to the more abstract definitions in DI that require loss of income. The changes to the original design have brought challenges that did not appear when the Personal Accident Disability Table was used for its original purpose. To understand these implications, Gen Re requested the opinions of independent medical experts as to whether the disability schedules designed for accident can also be appropriately applied for sicknesses. Those professional opinions support the conclusion that some sickness-related conditions may now be “unexpectedly” covered. The following sections summarise this feedback and review some of the benefit extension in detail to highlight the consequences – most likely unintended – of the benefit extension. 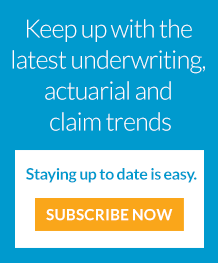 The underlying intention of the policy is to protect a policyholder from the effects of severe events. 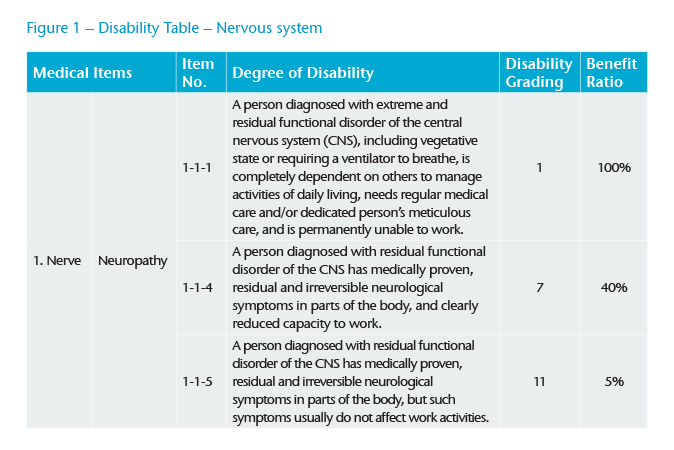 For example, a claimant with a tremor arising from a severe neurological condition, such as Parkinson’s disease, would have a reasonable expectation of meeting requirements of item numbers 1-1-4 or 1-1-5 (see Figure 1). However, claims for headaches or migraines that need treatment over an extended period of time could arguably meet the criteria, too. This means a decision to pay or deny a claim is controversial at the very least, a fact not helped by the unclear definition of the condition, particularly as no observation period is mentioned in the current provisions. Unless an existing diagnosis went undisclosed, a policyholder with asthma and a poor response to treatment could potentially meet the conditions of item 6-1-3 (see Figure 2). An individual with Chronic Obstructive Pulmonary Disease almost certainly would. Claims for main organ cancer under item 6-1-4 may be more controversial, especially for stage 0 cancers, but there is a high probability of claim under items 6-1-1, 6-1-2 or 6-1-3 for individuals diagnosed with invasive cancer. Excision of more than half of the main organ – for an esophageal, lung, liver, stomach, pancreas, colon, kidney, adrenal gland, bladder, urethral or ureter disorder – is likely to meet the conditions of all three items. Individuals with minor joint pain or stiffness prior to entering a policy may find their conditions deteriorate over time and even need knee or hip replacement surgery at a later date. More challenging issues are degenerative or rheumatoid arthritis, which are difficult to measure objectively and which could meet the criteria under item 9-4-12 long before surgery is contemplated (see Figure 3). Lastly, there is the potential for claims to arise under item 6-1-1 when a person is diagnosed as terminally ill. 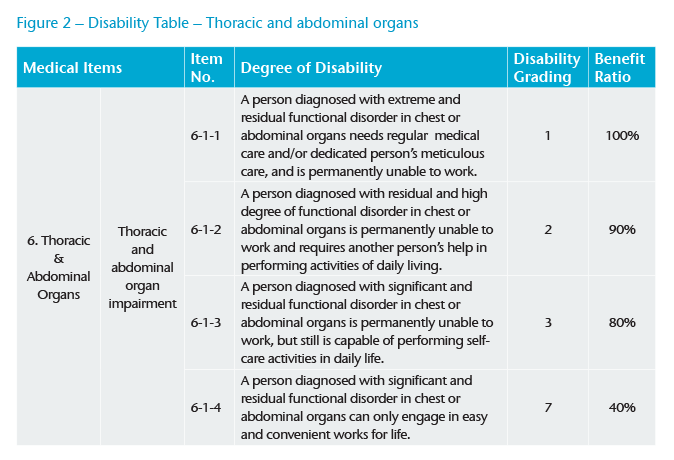 Significantly, note 15.1 in the Disability Table waives a requirement of a six-month survival period for conditions that can be determined immediately (see Figure 4). A person who has a terminal cancer – and who is in a hospice or receiving palliative care, or in some other terminal state – most likely meets this criteria. Thus we can conclude that the product now provides an implicit death benefit that has not been properly priced. The number of adverse claims observed to date is limited due to both the short sales history of this product and the fact that it is predominantly bought by younger age groups. But we conclude it is likely that numerous contested claims will arise in the future. To compound the effect, a comparison of the current risk rates with the possible claims rate – only for the conditions we highlighted – reveals that the product is most likely underpriced, which is aggravated by a high expected persistency after the end of the premium payment duration (see Figure 5). Gen Re research suggests the product therefore bears a significant potential responsibility for future losses, and the anticipated high persistency rates further aggravate the impact. This example demonstrates that extending the coverage of an existing product requires careful review to avoid unintended consequences. For this particular product, Gen Re was able to suggest mitigating changes to protect the future of the product. The current policy document states that a survival period will not apply if a condition can be determined immediately. The reason for this clause is certainly to settle obviously valid claims quickly. However, as the coverage was extended to sickness-related causes, this clause implicitly provides a death benefit. Therefore, the clause either requires revision to avoid such implicit death benefit coverage, or the benefit should be priced accordingly. The Personal Accident Disability Table was originally used for labour injury insurance and personal accident (AD&D) yearly renewable term products. The extension of coverage to sickness-related conditions and the increase of the attained age has opened the coverage for a number of common, potentially minor conditions with high prevalence rates, especially amongst the elderly. We recommended severity criterion be introduced to bring clarity that should help ensure the number of claims disputes is minimised, and that coverage and pricing match. Yi-Yin Lin, Chin-Shan Huang, Aging in Taiwan: Building a Society for Active Aging and Aging in Place, Gerontologist (2016) 56 (2): 176-183. For more perspective on how technology is changing life insurance, listen to our Digital Dialogues podcast series.